Bus stated in red are suspended service on Saturdays, Sundays, and public holidays. If you come from 'Shintoku station', please get on the bus bound for No.53 'Obihiro station'. 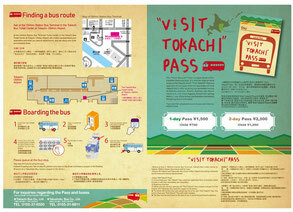 In addition, it is necessary to transfer to the bus for No.51 'Lake Shikaribetsu' at 'Takushoku Bus Shikaoi Office'. The bus goes towards "Obihiro station" when you pass by. Please be careful. If you going to 'Shintoku station', it is necessary to transfer to the bus bound for No.53 'Shintoku' at 'Takushoku Bus Shikaoi Office'. If you are coming by sightseeing to "Lake Shikaribetsu", we recommend using "VISIT TOKACHI PASS" convenient and affordable! 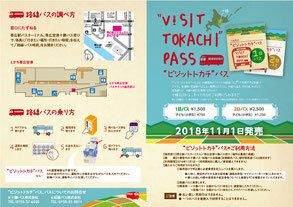 "1-day ticket 1,500 yen, 2-day ticket 2,500 yen" the general route bus in the Tokachi area can be ride unlimited. ・Obihiro Station Bus Terminal, Takushoku Bus or Tokachi Bus counter. ・Tokachi Obihiro Airport, Tokachi Bus counter. ★Notice for people staying at Lake Shikibetsu Spa "Hotel Fusui"
Please check the PDF data on the right for details. Copyright© Hokkaido Takushoku Bus Co., Ltd. All rights reserved.